Note: This article was originally published in the August 2007 issue of the Denver publication Community News. Who doesn�t like fruit, in all its sweet, juicy goodness? Some fruits, such as watermelon, peaches, and cantaloupe, are practically synonymous with summer. This article details some general benefits of fruit and gives specifics about blueberries, cherries, and cantaloupe. Adequate hydration (fluid intake) is always important, but with summer's heat upon us, it becomes especially important to avoid dehydration, which can impair the function of vital organs, such as the heart. Dehydration can cause headaches, muscle cramps, difficulty concentrating, dizziness, and other unpleasant symptoms. We know we should drink plenty of fresh water at any time of year, but in hot weather, it's also important to replenish the electrolytes, such as potassium, that are lost in sweat. The good news is that both electrolytes and fluids are present in most fruits, along with hearty doses of vitamins and antioxidants. So you can eat your way to better health while you treat your taste buds and enjoy all those beautiful colors. Blueberries are full of nutrition and flavor. They're at their best from May through October, but are available frozen throughout the year. Look for bags of Pacific Meadows Wild Organic Blueberries at Costco. I always keep a cup or so of those thawed in the refrigerator, stored in a plastic container, for heaping on cereal or spooning into yogurt. Blueberries possess antioxidant phytonutrients called anthocyanidins, which can help prevent glaucoma, varicose veins, hemorrhoids, peptic ulcers, heart disease, and cancer. Anthocyanins, which give blueberries their blue-red pigment, help the entire vascular system and enhance the effects of Vitamin C. Blueberries have been shown to be more protective of the heart than either red or white wine. They can protect the brain from oxidative stress and may help reduce the effects of dementia. Blueberries are high in the soluble fiber pectin, which can help lower cholesterol. Extract of bilberry, a cousin of the blueberry, has been shown to improve night vision. Try bilberry preserves for a real taste treat. Choose blueberries that are firm, with a uniform color and a whitish "bloom" (it protects the skin of the blueberries), and that move freely in the container if you shake it lightly. After removing any damaged berries to prevent the spread of mold, store unwashed blueberries in a container in the refrigerator. Do not wash them until just before eating, so as to avoid removing the protective bloom. Have you ever noticed that blueberries in baked goods, such as muffins or scones, may look a bit greenish? This is a natural reaction of their pigments, and it does not make the baked goods unsafe to eat. However, blueberries do contain oxalates, which can concentrate in body fluids, where they can crystallize and cause health problems. Therefore, people with a history of kidney or gallbladder problems might wish to avoid blueberries. But for most people, blueberries are perfectly safe and highly beneficial. Next up are cherries. Sweet or tart, they are lovely and delicious, as well as high in antioxidants, beta carotene, and fiber. Tart cherries are even higher in antioxidants than blueberries. All forms of cherries - fresh, dried, and frozen, as well as cherry juice - are beneficial. Cherries have been shown to lower cholesterol, lower blood sugar and insulin, and help slow the aging process. They are also fat-free, low in calories and sodium, and high in potassium, Vitamin C, and B-complex vitamins. Tart cherries, especially the Montmorency variety, contain high levels of melatonin. You may have heard that melatonin can help slow the aging process, fight jetlag, and help regulate sleep. I can't say I've noticed those effects from cherries, but perhaps that's because I eat mainly the sweet variety. And black cherry yogurt sends my taste buds to heaven! My favorite organic brand is Wallaby, at Vitamin Cottage. Cantaloupe is the most popular melon in the United States, and Colorado produces some of the best. This lovely melon is high in Vitamin A, Vitamin C, potassium, fiber, and niacin. Cantaloupes are best from June through August. How do you find a ripe cantaloupe? The melon should sound hollow when you tap it, and feel heavy for its size. There should be no bruises or soft spots. If the melon is unripe, the rind under the netting is greenish; if the melon is ripe, the rind has turned yellow or cream-colored. Also, you should be able to smell the fruit's sweetness. If you buy an unripe melon, store it at room temperature for a few days. Before cutting into the rind, wash the melon. Store cut melon in the fridge in plastic wrap or a plastic container. 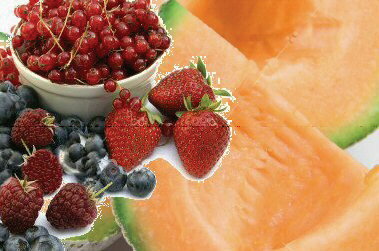 Cut fruit, if chilled, retains almost all its nutrients for at least 5-6 days. That's good news for all us lovers of fruit salad. So select a variety of your favorite fruits, load up a bowl, cover it with plastic wrap or put it in a plastic container with a lid, then enjoy the mixture for the next several days.